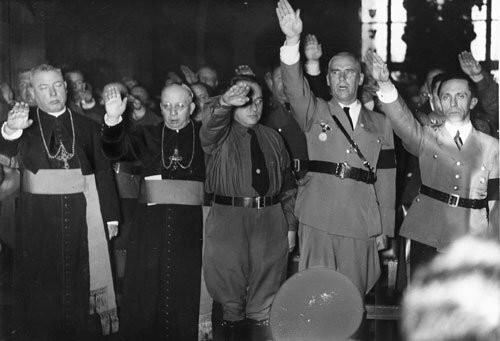 Catholic bishops joining in the Nazi salute. Nuzzi said he keeps a photo on his desk from the 1940s that shows all the German bishops in their garb, doing the Nazi salute. Anyone who fully understands and values the breadth and depth of Catholic Christianity must be appalled by this trend, especially when such oaths appear to be written in ways that clearly are contrary to Catholic teaching. What is more troubling, however, is the perspective expressed by some — both clergy and laity — who see no problem with such a practice. This entry was posted in Current Events and tagged bishops, Diocese of Arlington, fidelity oaths, Nazi, Nazism, US Bishops. Bookmark the permalink. Thanks for your comment. By your final sentence, I trust you were not implying that I was making any such suggestion, i.e. that one could be both “for Christ and anti-Christ, simultaneously”? In order to be Catholic, one must be in communion with The Catholic Church (Catholic Canon 750) which is why one can not be following Jesus The Christ, while following Hitler, simultaneously. To suggest that one can be for Christ and anti-Christ, simultaneously, is a lie from the start.